Isn’t it easier to just stay home? If that’s how you’ve been talking yourself out of moving overseas, then you’re not alone. Every would-be expat has, at some point, been haunted by this very thought. Of course, it’s no mean feat to insert yourself into a whole new life overseas. You have plans to make, procedures to follow, and unchartered waters to brave. Often, breaking free from the old familiar is a chance to follow a healthier lifestyle, too. Free from the nine-to-five grind of U.S. life, you’ll find you have more opportunity to explore the outdoors, connect with nature, and experience the beauty of your new country. You may find you can walk everywhere you need to be—and ditch the car for good. With more fresh, seasonal produce at hand, your waistline may shrink… simply by default. Right now, due to a strong U.S. dollar, the cost of living (and of acquiring property)—both in Latin American and European markets—is considerably lower than it was a decade ago. In other words, your budget will buy you a lifestyle overseas that is far better than what you could afford in the United States. The five destinations I’ll introduce you to below are the easiest places for U.S. citizens to start over. These havens are easily accessible from the States (some you can even drive to)… they offer straightforward residency programs specifically designed to attract expats… and, in all, you can live a much richer life on as little as US$1,200 (that’s less than the average Social Security check). 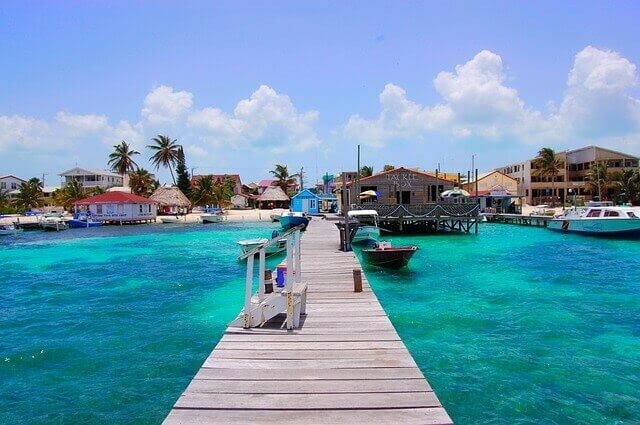 Belize has its mainland in Central America and boasts hundreds of tiny islands in the Caribbean. Mainland Belize has a lush vegetation of rain forest and jungle as well as mountains and grassy plains. The islands offer white-sand beaches, a relaxed pace of life, and some of the cheapest property deals in the Caribbean. Off the coast of Belize is a barrier reef that’s second in size only to the Great Barrier Reef in Australia. This reef provides a rich habitat for all kinds of marine life, including over 500 species of fish. Belize is also one of the least densely populated countries in the world. The cost of living here is very low, especially by Caribbean standards. Even established expat locations—like Ambergris Caye where prices are probably highest—provide excellent value and are far cheaper than living in most parts of the United States. Where Belize falls down is its infrastructure, and though it continues to improve, not everybody is up for the challenges of life here. On a positive note, English is the official language of Belize: This goes a long way in making your move here easier. How can you spend your time here? Don’t expect fine dining, ballet, or theater. Belize’s best attractions are all in the outdoors. The stunning coral reef makes it one of the world’s premier diving locations. The mountains and rain forest have great walking and climbing routes available with a range of exotic flora and fauna for you to experience. The pace of life is generally slow and friendly. What makes it so easy to move here: If you are 45 years or older, you can move here via the Qualified Retirement Program (QRP)—one of the fastest residency deals available. You only need to show a minimum monthly income of US$2,000 a month to qualify and spend 30 days a year in Belize to maintain your QRP status. If you are bringing a pet overseas with you, then Belize is your best choice. Simply get an application form from the Belizean Agricultural Health Authority and some certificates from your vet to confirm the animal is rabies-free. On payment of a US$20 entrance fee, your pet is legally allowed in Belize. Climate: The climate is subtropical with average temperatures around 27°C. Although you will get heavy showers during the rainy season, as well as downpours at night, most days are warm and sunny. Residency: You can apply for residency easily in Belize. You must pay a fee of US$1,000 and stay in the country for 50 consecutive weeks. This can be done by entering the country using a tourist visa, which you can renew every 30 days until you reach 50 weeks. As mentioned above, if you are at least 45 years of age, you can qualify for QRP residency by proving that you can bring more than US$2,000 a year into the country. Flight: Flights to Belize are easy to come by and fairly cheap from the United States. For the adventurous, it is possible to drive down through Mexico. You’ll need a solid vehicle for this, as roads along the way can be unreliable. Health care: Public hospitals are free and of a good standard. Private health care is also available, but it can be expensive if you don’t have an insurance policy. Colombia is a naturally beautiful, unspoiled country. Known for its “megadiversity,” it harbors a high number of the Earth’s species. Meanwhile, its landscape boasts mountains, rain forests, grasslands, and beaches. The climate is, broadly speaking, warm all year. However, due to the scale of the country, there is a wide variation in temperature. Otherwise, rainy season runs from May to November and dry season through the rest of the year. The cost of living is low, and you have a huge stock of natural produce to eat. Colombian coffee is among the best in the world. Though it’s taking the rest of the world some time to catch on to, Colombia is also much safer now than in the past. Though some rural and ghetto areas still experience drug-related crime, tourist and expat areas are generally as safe as major U.S. cities. Colombia has some excellent museums—many of which are located in Bogotá. A lot of the country’s history and traditions have been faithfully preserved and sit comfortably alongside the modern world that has sprung up around them. Archaeological parks, ancient churches, and national parks are dotted throughout the country and make for fine excursions—as well as coffee tours to sample the rich variety of blends available or jungle tours to experience all the rain forest has to offer. 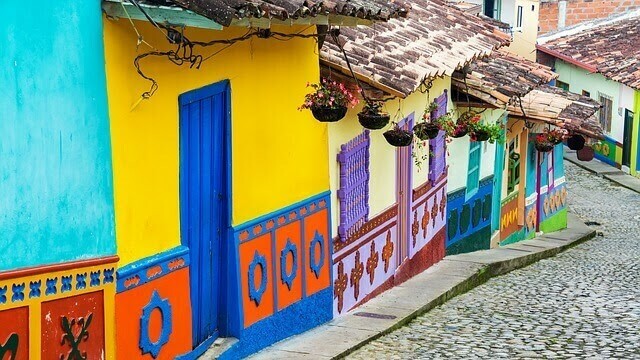 What makes it so easy to move here: The Colombian people are some of the most hospitable in the world and will go out of their way to make you feel at home in your new surroundings. Colombia is keen to get foreign investors into the country. If you’re looking to buy property here, they will do everything they can to ensure your application progresses smoothly. Flights: Flights from Miami take just 3.5 hours and a number of airlines offer direct routes into Colombia. Fares are cheap enough that you can budget in regular trips to and from the United States. Residency: Acquiring residency in Colombia is inexpensive. If you are retired and receiving a pension, you’ll need to prove a monthly income of US$629 to apply for a visa. If you want to qualify for residency as an investor, you’ll need to make an investment that’s 650 times greater than the minimum wage. This would currently be around US$135,000. Residency through starting a business is more expensive. Business culture here is completely different from the United States. It can take a long time, so, going this route, you’ll need to plan accordingly. Health care: Colombia has a public health system that offers cheap care to all citizens. Many expats like to pay for private medical insurance on top of the national health care. This will provide you with more specialist services as needed. Medical, dental, and visual care are provided under public health insurance, but more special treatments must be bought separately. With a tropical climate and average temperatures of 25 degrees Celsius, the Dominican Republic makes an attractive destination and excellent place to catch some winter sun. In the mountainous areas of the Dominican Republic, you can experience minus temperatures—something most people don’t equate with the Caribbean. What this does give you is variety. If you’re someone who doesn’t like the hot temperatures for too long, you can retreat to higher altitude and cooler climates. The Dominican Republic is part of an island shared with Haiti—with the Dominican Republic taking up the larger share. In fact, the Dominican Republic is the second largest Caribbean nation. It has a rich and fascinating history. Christopher Columbus arrived on the island in 1492, and the Spanish followed soon afterward—bringing with them their culture and building the colonial architecture that survives to this day. Towns like Santo Domingo are wonderful examples of this style and give the Dominican Republic a feel unlike anywhere else in the Caribbean. François Mackandal, who led the first slave uprisings on the island, had a particularly interesting life and his inspiring story is worth investigating. The Dominican Republic is one of the cheapest locations to live in the Caribbean. The government is rapidly developing its infrastructure, with new highways and roads being built. This is also a good place to do business—tourist-related ventures are particularly encouraged. As you’d expect from a Caribbean island, you’ll find plenty of white-sand beaches (unspoiled and often deserted) and excellent fishing here. In the cool Dominican Alps, strawberries grow on the mountainside and the highest peak is over 10,000 feet. From up here, you’ll have spectacular views across the island. What makes it so easy to move here: Dominican Republic residency is possibly the easiest in the world. A budget of US$2,000 a month in the DR would allow you to live like one of the elite. Even living on a Social Security check can provide an enjoyable lifestyle—one that’s unimaginable in other Caribbean destinations. 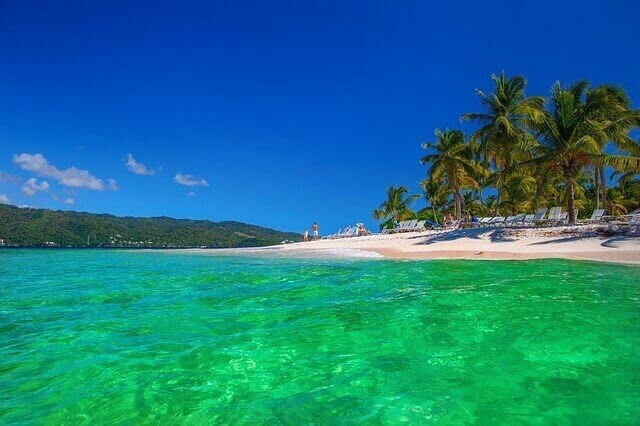 Residency: The Dominican Republic is one of the easiest and quickest places in the world to acquire residency. If you can prove your income, you should be able to get a retirement residency within a couple of months. You will need to have lived in the Dominican Republic for five years on a temporary residence permit before you can apply for permanent residency. Flight: The DR is a short—and fairly inexpensive—flight from the United States. Most major cities have direct flights here, and budget airlines also operate this route. Currency: The currency is the Dominican peso. However, because the Dominican Republic is a tourist hot spot, most places will accept U.S. dollars and euros. Health care: The health care in the Dominican Republic is great value—though not quite at the standard of Panama and Mexico. That said, unless you require specialist treatment, the DR will be able to meet your needs. Dental care, however, is excellent, and the country also has great facilities for laser surgery. 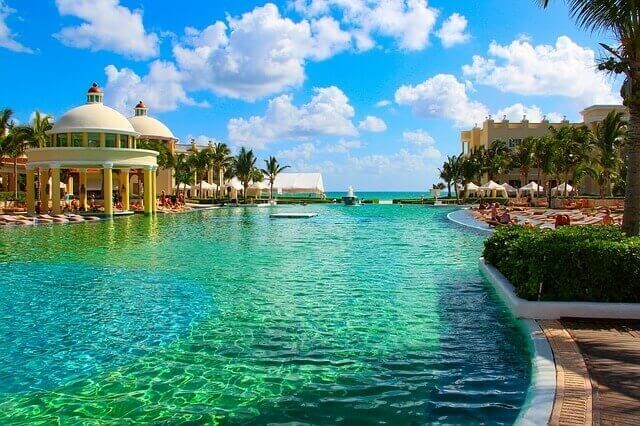 “Closer-than-ever” Mexico is the #1 expat destination for Americans, and it’s easy to see why… The climate is superb with hot summers, mild winters, and plenty of sunshine. Some parts of Mexico can be fiercely hot, while others—like Lake Chapala and Cuernavaca—offer a more temperate climate. Really, Mexico has something to suit everyone. In recent years, the government has been pushing hard to encourage more expats with heavy investment in infrastructure. Meanwhile, property prices have been appreciating nicely. You may know Mexico for its Corona and Sol beers, but did you know it also has a budding wine-growing area? Like California in a lot of ways, but without the price tag, Mexican wines are starting to gain attention worldwide. Vineyard tours and tastings are attracting more tourists and boosting property prices. Mexico has a wide range of attractions from Aztec ruins and ancient observatories to sleepy towns. Festivals are a huge part of the culture here. The big ones, like the Day of the Dead, will bring whole cities to a standstill. What makes it so easy to move here: For a start, you can simply pack up your belongings and drive to Mexico. Moving from the United States to Mexico is a well-trodden path, and you’ll find plenty of long-established expat communities here. Real estate agents in Mexico are experienced in dealing with U.S. clients and will be able to make sure your move goes smoothly. Residency: Obtaining residency in Mexico is straightforward. A Temporary Residence Visa allows you to stay in Mexico for up to four years. During this time, you can travel in and out the country as often as you need. After four years, you can apply for permanent residency at your local Mexican embassy. Flight time: Moving to Mexico could be as simple as jumping into your car and driving down. But Mexico is also an easy flight from most U.S. cities. Lifestyle: The lifestyle in Mexico is varied but always relaxed. The cities have opera, museums, and galleries, in addition to excellent restaurants. In the countryside, you can find folk parades, fiestas, and other traditional pastimes. On the coast, Mexico has surfing, fishing, snorkeling, and diving… as well as miles upon miles of excellent beaches. The cost of living is lower than the United States, and the lifestyle can also be healthier owing to fresher meat, fruit, and vegetables. Currency: The currency is the Mexican peso. In tourist areas, you can pay for things in U.S. dollars but will get an uncompetitive exchange rate. Increasingly, businesses are insisting on payment in pesos. Health care: In general, the health care in Mexico is excellent and far cheaper than in the United States. Charmingly, doctors still make house calls, and most speak English. On average, a visit to the doctor or specialist will cost around US$30. Panama is the most popular destination for expats in Central America (we’re considering Mexico as part of North America). The U.S. presence here dates back to the building of the Panama Canal—the legacy of which is the main reason for Panama’s continued economic success. The tropical climate ensures warm temperatures all year. If the heat and humidity of the city are too much for you, areas such as Chiriquí provide an attractive, cooler option. On a mission to become the Singapore of Latin America, Panama is currently experiencing a rapid expansion—and many of the world’s biggest multinational companies are now based here. New trade links with China, and continuing investment in infrastructure, means that Panama’s future prospects continue to look good. Panama has an abundance of jobs for native English-speakers—although some require you to be fluent in Spanish as well as English. Panama offers something for everyone. The Frank Gehry-designed Biomuseo in Panama Citycelebrates the abundance of spectacular animal and plant life and is one of the most unique museums in the world. Panama has Caribbean and Pacific beaches and miles of unspoiled countryside. Meanwhile, Panama City has everything you would expect of a modern cosmopolitan city. What makes it so easy to move here: For retirees, Panama rolls out the red carpet in benefits. 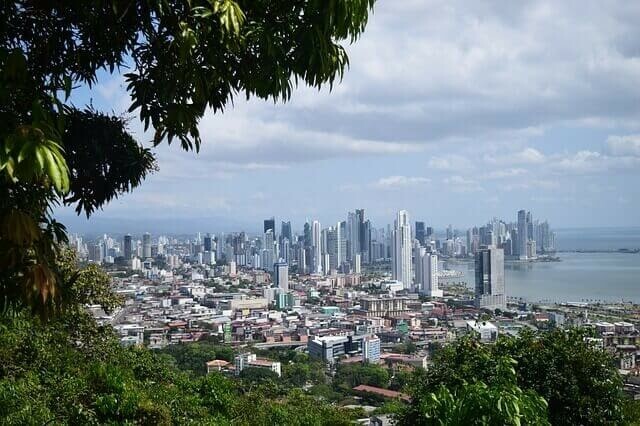 If you want to live in Panama City, you’ll find speaking Spanish is not a requirement (although it is recommended that you learn at least some). Panama is also well connected to most U.S. cities—as well as being a hub for onward travel to anywhere in Latin America. Residency: Residency in Panama is easy to acquire. If you get a written job offer or can prove that you have funds available for retirement, residency is yours. Panama’s pensionadoprogram is the best, most-laden-with-benefits retiree package out there today. If you meet the requirements, you get discounts on all sorts of services from doctor visits to movie tickets, to domestic and international flights. And, should any future changes occur to pensionadolaw, you are protected. Once a pensionado, always a pensionado. If you’re planning to invest in a business in Panama, you can acquire Panamanian residency by that route, too. Flights: Panama is the central hub for all flights to the South Americas. Flights here are easy to find from the United States. Panama’s Tocumen Airport (PTY) is currently expanding with the intention of including more European routes. Recently, Emirates has resurrected its plans to launch a non-stop flight from Dubai to Panama that would, if it comes to pass, be the longest direct flight in the world. Currency: The Panamanian currency is called the balboa and is pegged to the U.S. dollar—which is also legal tender here. Aside from the convenience, this makes it very easy to appreciate just how far your dollars go in Panama. Health care: Health care in Panama is of a similar standard to the United States, and prices are far cheaper. Due to the low number of people availing of the facilities (when compared with the United States), you can expect a more personalized service. Most of the doctors speak English well, and prices for prescription drugs are also far cheaper. Dentistry in Panama is also excellent, and dental tourism is becoming popular. Many Panamanian dentists are trained in the United States, so the standard of treatment is equal to—though a fraction the price of—what you find back home. Looking for great travel photography tips? What to know the best spots in London to snap those travel memories? Then read Photographing London: Iconic Locations and Hidden Gems by the PHOTO Team. KIDS SAVING THE RAINFOREST TO PLANT 400 TREES THIS EARTH DAY!